Home Marketing What to Do When a Savings Maneuver Backfires? Global flat-pack furniture giant IKEA is facing fierce blowback following its decision to retire its immensely popular EXPEDIT shelving systems and replace them with a new product line called KALLAX. The backlash is from general fans of IKEA who don't like to see change, but specifically from collectors of vinyl records, who have long used the EXPEDIT's 12"x12" chambers to store their records. IKEA has attempted to assuage the situation by assuring those upset at the change that the internal dimensions of the shelving systems will not change, but that just raises another issue. Looking at what few pictures are available of the new KALLAX system, and from IKEAs own statements, it's apparent that while KALLAX shelves might be the same size, the overall unit will be smaller. Meaning, the outside support pieces of the shelving unit will be thinner. As we've pointed out in a previous article concerning an IKEA model change, minimal dimensional changes results in products that can be sold at similar price points but with a lower production cost, and can add up to very large savings for IKEA. The key difference here is the customer base for the products, and their resistance to such change. The first model revamp (mentioned in the above-linked article) was for kitchen cabinets. There's not exactly a rabid fan base around kitchen cabinets -- at least, I'm not aware of one; feel free to prove me wrong -- and people don't typically buy kitchen cabinets in shifts, matching them up as they go along. The EXPEDIT/KALLAX changeover involves an insanely popular shelving system used by vinyl junkies and homeowners alike. If you've ever been to a trendy flea or farmers market, or a Yo La Tengo concert, you'll understand the fervor in which record collectors can react. Additionally, EXPEDIT shelves are bought periodically and expected to match. 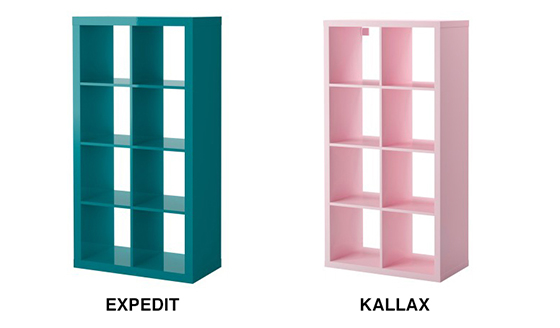 In short, IKEA may have to transition some -- or, potentially, a large part -- of the money saved from the slimmer, cheaper-to-make KALLAX to increase public relations efforts and assurances that KALLAX isn't as drastically different from the EXPEDIT system it replaces. Or, the company may bank on the fact that this uproar comes well before the expected April 1 European rollout (and the later US debut) and that the complaints, Facebook campaigns, and Twitter fury will have died out and customers will have accepted the change to the model. Manufacturers have long found savings by gently reducing the amount of a product sold for a set price (the ever-present grocery shrink ray), making such a change without consumers really noticing or saying much. In the rare cases where consumers do notice, the potential savings can dissipate quickly -- mitigated by a drop in the consumer base and an increase in the advertising and public relations budgets. There are considerable savings to be found in redesigning products to lower production costs, but the risk of consumer uproar is always present. EDIT: Gizmodo.com is talking about the same thing, and they're willing to guess numbers that I was not. Interesting read.